Ukrainians (as also many other Europeans) use honey in cooking, baking, and home remedies to treat almost anything. My dad would always concoct some home remedy with the use of honey, but then again, one of his hobbies was beekeeping. Here is my favorite recipe for a honey cake, which I call “Never Fail”, as it never has failed me yet. You can use a little bit of creativity, and turn one plain honey sheet cake into three different tortes. 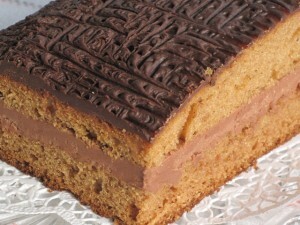 One third of the honey cake is iced with chocolate ganache and walnuts, second part will remain plain, and third part will also be iced with chocolate ganache. Once the three sections are separated, the plain one is sprinkled with powdered sugar before serving. One section is layered with two layers of white frosting flavored with Bailey’s Irish Caramel Cream liquor, topped with chocolate ganache. Another section is layered with one layer of rum flavored chocolate icing, and topped with chocolate ganache. Beat eggs and sugar until thick. Add vegetable oil, honey, and sour cream. Mix flour, baking powder, baking soda, cinnamon, cloves, and allspice. Gradually mix it into the liquids. Add vanilla, and mix well. Grease and flour two loaf pans, or a 9 x 13 sheet cake pan (I use the sheet cake pan). Pour batter into the pans. Sprinkle nuts over top (optional). Remove from the oven, and cool in pans for 10 minutes. Remove from pans onto wire rack, and cool completely. Cut to serving pieces and sprinkle with powdered sugar, or If you decide to make it into a torte, this is the time to cut it into layers, and spread you favorite filling. Wrap the torte in foil, or saran wrap, and keep it refrigerated, until ready to serve. Honey cakes also freeze very well, but you need to wrap it in paper towel, then foil, then freezer plastic bag. Thaw in the fridge a day before serving, all wrapped, to preserve moisture. You can turn this plain honey cake into a torte, by cutting horizontally in half, or more layers, and layer it with your favorite butter icing. You can frost the sides as well, but it will be fine just leaving them plain, and pouring chocolate or vanilla glaze over the top and letting it drip down the sides. Once the three sections are separated, the plain one is sprinkled with powdered sugar before serving. One section is layered with two layers of white frosting flavored with Bailey's Irish Caramel Cream liquor, topped with chocolate ganache. Thank you for sharing this recipe. My cake is baking as we speak. The batter tasted delicious and my house smells fantastic. 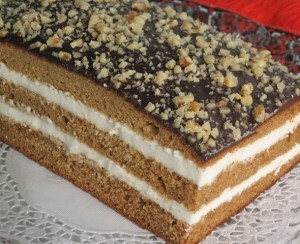 I think this is the cake that I remember from my childhood in Kiev. Merry Christmas! The cake was fantastic- best recipe out there. We’re baking another one right now. Thank you for restoring a family favorite. You are soooo sweet and kind. Thank you for taking your time to leave a follow up comment. 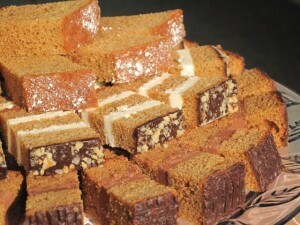 Enjoy your honey cake and please pass it on to others. Can I replace oil with softened butter? Is it possible to decrease the amount of sugar? Will it affect the texture of cake if, for example, I reduce oil or butter to 1/2-3/4 cup or reduce sugar to 1/4-1/2 cup? I have another recipe of honey cake (like cookies with sour cream filling) but am looking for a more ‘cakey’, spongy honey cake that can even be rolled. By the way I tried your other honey cake (7 layer honey cake sheet) recipe and it was great though I did reduce sugar to 1/4 cup and honey to only 1/2 cup and used butter instead of oil. Thanks a lot! I think butter makes the cake more crumbly, and oil keeps it more spongy. Reducing sugar should not affect the cake texture too much, but it will make it less sweet of course…Sounds to me like you have your ingredient alterations under control….so I am sure your cake will be a success, and please share your experience with all of us. Thank you. Thank you for sharing this recipe! Would you be able to share your chocolate ganache, white frosting, and chocolate icing recipe as well? I love the idea of making three different parts! Chocolate Icing would be the same as the regular vanilla (on the powdered sugar bag), plus adding some cocoa powder or melted chocolate. Thank you for stopping by and reading my blog. Have fun making the honey cakes..:-) I am making some for Christmas as well. 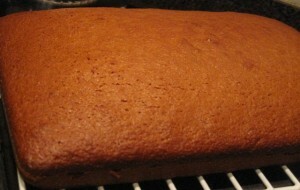 Thank you for trying my honey cake recipe, and enjoying the taste. Sorry, it is not the one you were looking for…hopefully you will stumble upon it in the future. 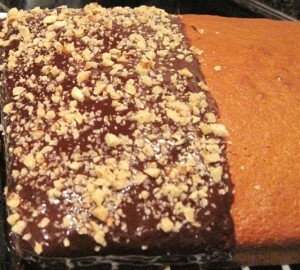 In Brazil the Honey Bread is very popular, specially covered in chocolate. I had never seen it here in the US. I could only find gingerbread recipes, but it was not the same. I know the Germans like it too but they add ginger. I finally found it here! So, maybe it’s an Ukranian recipe and not German? Thank you, I am going to try this as well! I forgot to mention that in Brazil we make it with milk as we don’t have sour cream. I am going to try your recipe, I am sure it will be even better! Thank you! Thank you again for your comment. 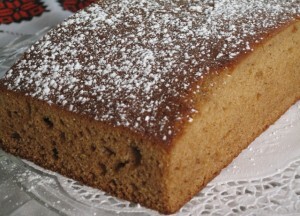 Yes, Honey Cake is very popular among Ukrainian and Polish bakers. I also made it once with chocolate glaze on top, but my family prefers the plain one. I am glad you liked my recipe. There are lots of Ukrainians living in Brazil, so I wonder if the popularity of a Honey Cake was due to their baking preferences. Hmmm….I am sure it is just as good. I wonder why one would not use buttermilk or yogurt rather than regular milk, to have it closer to the sour cream ingredient. Maybe those items are also not readily available in Brasil. Thank you for sharing.